Sunnyside Cottage i hjertet av Lakeside med badestamp! Som navnet antyder, er Sunnyside Cottage en lyst og koselig hytte i hjertet av Lakeside. Den nylig renoverte hytta er fullstendig renovert, for å inkludere et meget åpent konsept, bestående av stue, spisestue og kjøkken. Innredningen har blitt oppdatert hele tiden. Boligen har 3 bad og 4 + soverom, alle i en etasje. Soverom en har en queen size-seng og eget bad, soverom to er en dronning, soverom 3 har to køyesenger, soverom 4 har en tvilling og en full, pluss det er en liten hue / soverom med en dobbel sovesofa. Nydelig kjøkken med kvarts benkeplater, stue med peis. I tillegg er det en nydelig veranda, utendørs dusj og privat 5 person badestamp (åpent året rundt!). Ligger i Lakeside, 2 kvartaler til privat Orchard Beach-tilgang. * Alle gjester må signere og returnere våre Guest Occupancy Agreement. ** Minimumsalder på 25 år å leie. We loved this property, the location, the amenities, easy check-in. The large and well-stocked kitchen was great. The property was very clean, having stocked firewood was such a treat. We hope to stay here again! 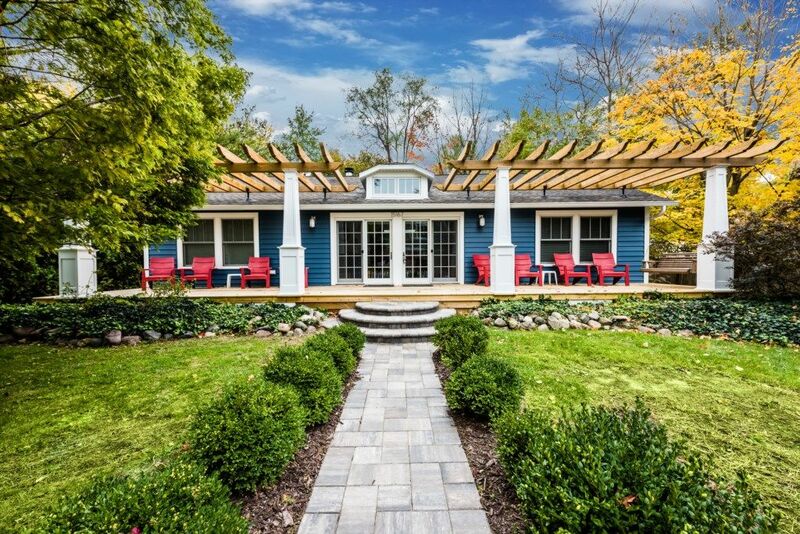 Beautiful and clean vacation cottage! We loved our trip to Lakeside and Sunnyside Cottage! The cottage was airy and spacious, clean, updated and had everything we needed for a wonderful week! The walk to the beach was three short blocks, a little far for toddler legs... but the wagon provided in the playhouse was a great way to haul everyone back after a long day of swimming and sand castle building! Thanks for sharing your home with us! A great house anytime of year! I want to thank both Jason from Bluefish rentals and his staff for making this vacation week the best my family has enjoyed in the last five years of trips to the New Buffalo area. Jason has been able to make our stay so easy with his extra care and helpfulness. One year he solved an issue of a lightning strike to our vacation unit in the middle of the night. This year he helped at arrange the delivery and pickup of an oxygen concentrator to the house for my use. The Sunnyside Cottage had everything we needed to make our week extra special. The only request would be a fire-ring at the cottage for those evening bonfires. Great renters at a great rental! This property was perfect. The house was immaculate. The kitchen was to die for and the openness to the living area was perfect. Beds were very comfortable. Walks in the neighborhood we’re very enjoyable. The walk to the very nice beach was easy even for us elderly grandparents. Quite a bit of driving for groceries or any other stores. Nothing much available nearby. A great house anytime of year! Book today!